Funded by the Australian Research Council and Cancer Council Australia, ‘the Alcohol causes cancer! Study’ aims to determine what the Australian public thinks about, and how they might respond to, warning labels on alcohol products. 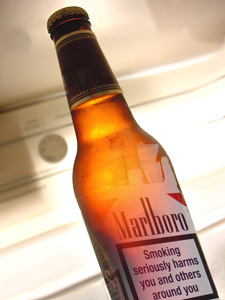 The three-year project involves five stages whereby the researchers will look at the kinds of messages about alcohol and cancer that are currently in the media and online; analyse ethical arguments for and against placing cancer warning labels on alcohol products; and conduct a nationwide online survey along with focus groups to find out peoples’ views on such alcohol warning labels. The research is led by Dr Emma Miller from Flinders University, her collaborators hail from the University of Adelaide, Cancer Council Australia, Drug and Alcohol Services South Australia and James Cook University. Dr Miller said although alcohol is the most widely used drug in Australia, many people are unaware about the link between alcohol and cancer. “Most people realise that drinking too much or too often can lead to injuries and other problems, but there is growing evidence to show that even low to moderate drinking might increase the risk of developing some kinds of cancer in the long term,” said Dr Miller. “Since many people aren’t aware of this link, several public health and research institutions have suggested that we put labels on all alcohol products to warn about the cancer risk,” she said. Dr Miller said a series of focus groups have been asking people to consider a range of factors involved in labelling – such as placement, colour and contents – to determine how such messages could be acceptably and effectively used to inform Australians about the long-term, but modifiable, cancer risks associated with alcohol use. The online survey, which is based on this information, aims to find out the broader Australian publics’ view and is open until October 5. “The types of aspects we have looked at include gauging the public’s perception on placing smaller warnings on the front or back of bottles, or replacing the brand label entirely, as well as colour. The survey particularly focuses on what the message says and who it comes from. Dr Miller said the researchers are not advocating for alcohol warning labels but trying to work out how best to let people know about the cancer risk associated with alcohol.